If you regularly wear dentures, you’ll be able to tell the difference between day 1 and day 500 of wearing them. Dentures are not meant to last forever, but they should still last for several years before needing replacement. So instead of replacing them, your dentures in Waco can be relined to fit more appropriately in your mouth. Depending on the amount of discomfort you’re feeling, the dentist can actually reline your denture in a single visit. Luckily, if a relining doesn’t work, there are other ways to make your prosthetic teeth comfortable once again. What is Denture Relining and Why is it Needed? Denture relining is a simple and affordable procedure designed to reshape the undersides of dentures. This makes wearing them more comfortable and performing basic tasks like eating and talking easier. If you’ve recently lost teeth and have just gotten dentures, it’s likely that your alveolar bone tissue has started to change shape. When teeth are no longer housed in this alveolar bone, it starts to resorb and travel to other parts of the body where it’s needed. Within the first three to four months of your teeth extractions, you’ll likely start experiencing a change in your gum tissue’s density and the shape will begin to transform, causing the denture to fit improperly. That’s where denture relines come in. Denture relines are separated into soft and hard because one main difference: the treatment method. Soft relines are done with a liquid polymer applied by your dentist. This liquid is lined into the underside of the denture to add depth and cushion. Since this procedure is quick, you can walk out the office with a more comfortable denture in a single visit. Additionally, if you’re sensitive to your new denture, this soft relining will be easier to manage at first, especially if you’re experiencing the early stages of bone resorption. 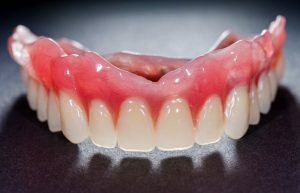 However, due to the polymer’s soft, porous attributes, it’s more likely that you’ll need to fine-tune your dentures more often to keep them comfortable. That’s where the alternative of hard denture relining is considered a better option. Unlike a soft relining, this treatment uses a material that feels more like the base of the denture itself. This process is considered more permanent and long-lasting than soft relining, but also requires your dentures be sent to a dental lab for production. The fix will last a few more years, ensuring that you won’t have to visit the dentist again until then. Keep in mind that soft relining can also entail sending your dentures to a lab, but this will be determined by your dentist in Waco. Regardless of the method, you shouldn’t have to deal with discomfort. Schedule a consultation with your dentist so they can fix your smile! Premier Family Dental offers many tooth-replacement options, including full and partial dentures to give you back your smile again. They also offer implant-supported dentures, which create a stronger, longer-lasting fit, and better bite than traditional dentures. To learn more about this treatment as well as their relining procedures, contact Dr. Rick Cofer at (254) 732-0309 or visit his website.